Originally published in 1896 as The Boston Cooking-School Cookbook, this comprehensive and instructive volume is one of the foundation stones of American cuisine. It also introduced a number of seemingly basic concepts like standardized measurement to home cooking. Before Fannie Farmer you might be called upon to put in as much salt as a sparrow would spit or a king's handful of sugar. 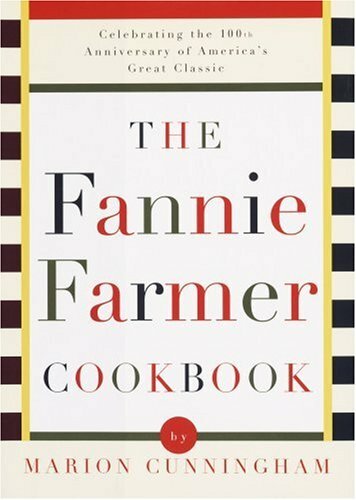 Maybe people weren't eating only gruel but Fannie Farmer did make cooking better, which is exactly what it's done for myself and will likely do for you. The current edition, updated in 1996, offers modern day cooks updated versions of the recipes with instructional advice on ingredients and utensils for the modern kitchen. Much like the far more lauded Joy of Cooking, all commonly available ingredients have a breakdown on types and guidelines on buying, storing, and preparing. Unlike that other worthy volume, and the thing that makes this book far more deserving of universal use, Fannie Farmer is committed to providing simple guidelines and straightforward recipes. It will also have you flipping back and forth through the book in the middle of preparing your dinner far less than the heavily cross-referenced Joy of Cooking. As part of it's commitment to everyday use, and unlike most cookbooks which turn their noses up at the very notion, this book will tell you how to get some mileage out of your microwave and save some kitchen time while letting you know when the results of microwave cookery will be unacceptably inferior (generally always, but you don't actually need to spend an hour baking that pumpkin for a pie, ten minutes in a microwave and the result is indistinguishable). The recipes are not the most artful iteration of the dish but are usually the simplest and, for the novice cook, easiest to prepare. They function almost as a basic course in ingredient usage, after a week you'll find yourself better understanding the basic properties of things like butter. This is the book that will make an amateur baker out of a Hamburger Helper cooker and will also serve well as a reference for the more experienced cook who should find the recipes easy to modify to personal tastes.